Forgotten Horrors > Horror > Mystery > Spies Espionage and Intrigue > Sword and Sandal > Edgar Wallace > Fantasy > Jungle > Juvenile Schlock > Sci Fi > Sinister Serials > Kung Fu Martial Arts > B Westerns > Silent Thrills > Spaghetti Western > Exploitation > Action Adventure Thrillers > New Releases > DVD > Current Sales > Westerns > Poverty Row Collections > Armchair Fiction > Double Novels > Short Stories > Single Novels > Drive In Double Features > Armchair-New! > Trailers > Poverty Row Collections-New! Simply add this product to your cart to take advantage of this great sale. 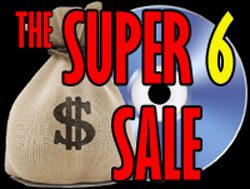 Buy any 5 titles from our website catalog and receive the 6th title absolutely free. Remember, this sale applies to all titles in our website catalog. WE WILL ADJUST YOUR FINAL TOTAL! Don't worry about the total on your invoice during checkout, we will adjust your total on our end and you will only be charged the sale price. We will also pick your most expensive title(s) to be your free title(s). If you have any questions simply drop us a line at scinema@qwestoffice.net or give us a call at 541-773-6860. Thanks!